These were sent to me as samples by a nice PR person, but it took me a long time to get around to tasting both of the “Big House” wines, mainly because I saw them as gimmicky and figured they weren’t terribly interesting. As it turned out, both wines mildly surprised me — they are easygoing and simple but enjoyable and have enough structure to match with a variety of foods. That’s the nice thing about having no expectations — it’s hard to be disappointed. The name “Big House” came about because the winery is located “an ankle iron’s toss” from the Soledad State Correctional Facility in Soledad, California (Monterey County). It was founded by Randall Grahm — better known as the founder/winemaker at Bonny Doon — and the brand’s focus is to appeal to the “non-snob” by making wine less complicated and more fun and easy to enjoy (hey, just like this website!). I have to admit the branding is clever and appealing, if a bit corny. But, I’m corny myself and therefore have an appreciation for their efforts. 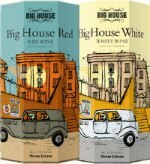 Big House White is a fruity summer sipper with a faint hint of sweetness that makes a good foil for spicy hot foods. I paired it successfully with Indian cuisine as well as buffalo wings and BBQ ribs. It’s also thoroughly enjoyable on its own, with a good chill. For those who care, it’s made from a “kitchen sink” blend of 22.7% Malvasia Bianca, 15.9% Gruner Veltliner, 15.7% Sauvignon Blanc, 9.2% GewÃ¼rztraminer, 7.9% Riesling, 7.3% Chenin Blanc, 6.1% Muscat Canelli, 5.2% Viognier,4.5% Verdelho, 4.4% Albarino, and 1.1% Pinot Gris. If nothing else, all those grapes in there make for a good conversation starter. Big House Red was similarly friendly with food, but completely dry. It has an attractive, expressive nose full of black cherries and a hint of earth. On the palate there are similar flavors — cherry, red and black berry fruit, mild earth, touch of tobacco. There is plenty of acidity and very mild tannins. It finishes somewhat quickly and with tart, sour cherry. Overall it kind of reminds me a Beaujolais Villages, and is similarly easy to pair with just about anything — particularly lean meats (chicken, turkey, pork), vegetarian dishes, and pasta with red sauce. And yes, this one is made with myriad grape varieties as well: 27% Petite Sirah, 14.5% Syrah, 8.6% Montepulciano, 8.2% Barbera, 6.4% Nero dâ€™Avola, 6.1% Tempranillo, 3.3% Malbec, 2.4% Aglianico, 2.4% Souzao, 2.3% Charbono, 2.2% Petit Verdot, 2.1% Cabernet Franc, 2% Tannat, and 12.5% Other Esoteric Reds. I’d love to know what those “other esoteric reds” might be, and why they’re not listed. Ah-ha! Another conversation starter! At under $10 for a 750ml bottle, these wines are a steal — but it isn’t the kind of theft that will get you sent to the “big house”. And both wines also come in snazzy, convenient, party-friendly bag-in-box packaging as well.